What are the things we do in secret – when no one is around to see? What do we do when we’re sure we won’t ‘get caught’? How often do we lie to ‘cover-up’ something we did but we don’t want to held accountable for it? These are the things – and there are many more – that we do in the darkness. Always bad choices – that’s why we do them in the darkness, in secret. We hope these things never come out into the light. He knows everything that is done in the darkness. 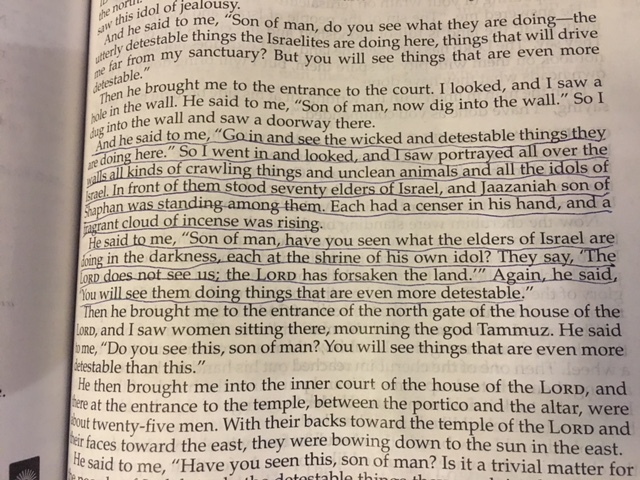 God reminds us of this in the 8th chapter of Ezekiel as we read the account of how God supernaturally brought Ezekiel to Jerusalem to show him the elders of Israel who are standing in the darkness as they worship all of their small gods. Who did they think they were fooling? They knew better. Who were they trying to convince? The LORD saw it all. He had not forgotten about them. He never forgot about them. They were the ones who had turned away from God to worship these worthless idols made by man’s hands. And they chose to do this in the darkness. They knew it was wrong so they tried to blame God. But blaming God just doesn’t work. He sees all the things we do in secret – all the things we do in the darkness. And he loves us in spite of all of it. He has forgiven it all for all time through the sacrifice of his son, Jesus. When we accept Jesus as our Savior, we are forgiven and we are redeemed from the darkness. We still might wander sometimes, but God is always waiting and wanting us to turn back to him. God has placed us on this planet to help him push back the darkness, not to be part of it. What would our lives look like if we stopped tiptoeing into the darkness? Thank you for the gift of your grace, Abba Father.